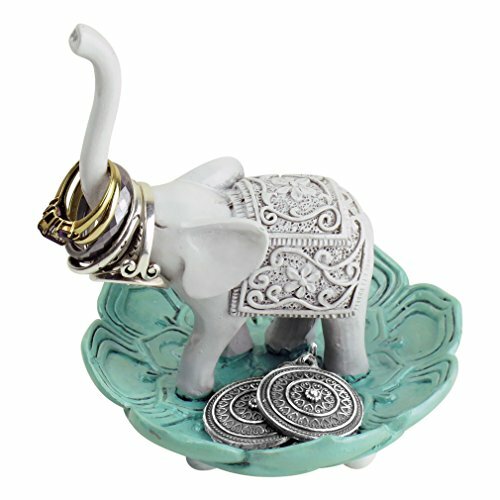 This decorative elephant ring holder displays beautiful etched designs on the body of the elephant and open lotus flower. Rings slide onto the elephant’s upturned trunk and small jewelry like earrings, pins and necklaces rest in the lotus flower bowl at its feet. Place this jewelry stand for safe-keeping on the bathroom or kitchen sink, bedside, dresser or closet - anywhere you want to organize and display jewelry. Great gift idea for the jewelry lover, birthday present, holiday or just to say thanks to a friend. Small size and lightweight design makes this jewelry holder perfect for travel. Constructed out of polyresin with a shiny gloss finish. This ring holder will add an elegant and fun touch to any room. Measures approximately 2.5"L x 1.13"W x 4"H, with a 3.25" base diameter. Jewelry and accessories not included. UPSCALE DESIGN! Made out of polyresin with a gloss finish. Measures approximately 2.5"L x 1.13"W x 4"H, (including the elephant's trunk) with a 3.25" base diameter. TRUSTED VENDOR! For years Evelots has been bringing unique products with a 30 day, easy return policy and 100% satisfaction guarantee.